Name badges are usually an attendee’s first interaction with your event and an important way to promote networking. Here’s how to up your nametag game. Strive for clean lines, minimal design and no more than three colours so your badge is easy to read. Mix It Up: Koshman says clients like hard plastic event badges designed to be like backstage passes. Some planners opt to use the back of the badge to print attendees’ individual agenda, including room assign­ments. And instead of standard index card-style rectangles, let a new shape tell your event story. “Shapes are definitely on trend and people are excited about them,” says Koshman, noting that planners can choose from templates or create custom shapes. You might also consider offering badge real estate for sponsorship opportunities or adding a raffle number on the back for draws during sessions or at meals. Go Eco-Friendly: More clients are asking for sustainable or reusable materials, says Koshman. Biodegradable holders, organic cotton lanyards and recycled paper can result in virtually no waste. Some badges are constructed from reclaimed wood, leather, bamboo, metal or recycled plantable paper: Wear it, then plant it and watch it bloom. Ecclestone notes that biodegradable badge holders made out of cornstarch can go straight into a compost bin. Don’t forget to collect your badges and lan­yards to re-use or re-purpose, says Ecclestone, whose teams set up a collection box on the final day. Leverage Your Lanyards: Ditch that chintzy thin white cord in favour of full-colour lan­yards, Koshman suggests. “It’s a place where planners can sell some sponsorship and add to that cohesive theme,” she notes. 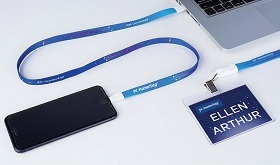 Her com­pany offers the Get Connected lanyard, which doubles as a phone charger cord, and can be branded. “Do whatever you can to make sure guests’ names are always facing forward,” adds Ecclestone. Opt for no-twist/no-flip attach­ments such as double clips on lanyards. Add conversation starters on badges like ‘Ask me about’ or ‘Tell me about’, leaving a blank space where attendees can add their preferences. Tech Specs: Smart badges—embedded with RFID technology—can provide digital foot­prints that track attendee behaviour. Nametags can also become interactive using QR codes, notes Koshman: Attendees can walk around a trade show floor and scan exhibitors to win prizes. Badge technology from Proxfinity is loaded with delegates’ contact information and responses to a survey about interests, so that when one guest nears another with similar interests, the badge lights up. Klik badges, made by PixMob, combine Bluetooth and mobile tech and enables planners to commu­nicate with attendees using LED lights.